Hey, I’m just putting up a super quick idea that I’m using for gifts this year. I know that there are some of you out there who have all of your gifts already wrapped, so you can just tuck this idea away for next year. I also know there are just as many of you that have not wrapped a single present, and who maybe even haven’t finished (or started!) buying them. I like to make my gifts look lovely all wrapped up, but I’m also all about saving myself some time. 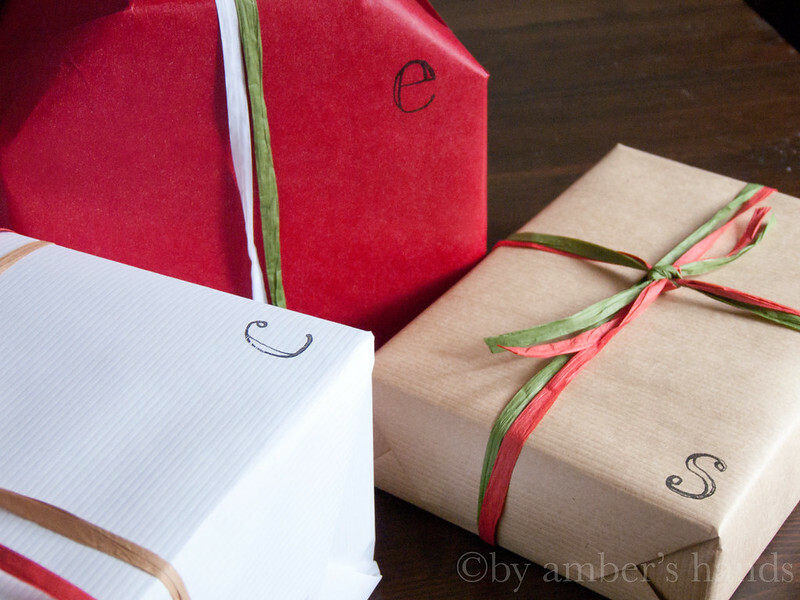 Last year I told you I’d started using craft paper instead of Christmas wrapping paper, and I still love doing that, since it saves me money & headaches. Last year I bought some really cute gift tags for each gift. This year I didn’t have enough tags and I was not excited about having to make yet another trip to yet another store, so I decided to use stamps. I just used the first initial of the recipient’s name, since we don’t really have any repeats in our family. You could do whole names or initials if you do. This way I’m not writing up lots of tags & tying them on, or making little flaps out of paper to stick on. I just have a few stamps and stamp them right on. I’ll still use tags for the presents from Little Man, since he loves to try to write his name, and that way they’ll be easier to tell who they’re from. But for the ones from Hubs & I, just initials. It makes my life easier and I think it’s super cute.